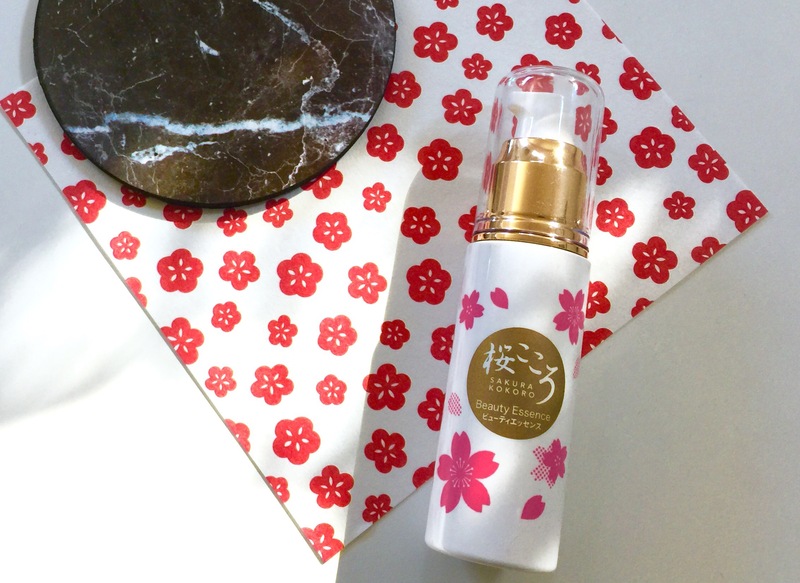 There is no shortage of Asian beauty products with really, really long names and so it’s nice to find a product called something a little simpler! This serum is simply called “Beauty Essence” and is what we’re looking at today. Let’s take a look! Beauty essence that can spread smoothly over the face without any sticky feeling. Apply regularly in the morning and night to get a supple brighter skin. This is a serum. Use this after your lotion steps but before emulsions and creams. 30ML. $59.32 on Ippin, who kindly sent this to me for review. Ippin is a new Japanese e-commerce site. I wrote about them in more depth here. This comes in a white, air-tight pump bottle covered with cherry blossom illustrations. Super cute and very practical! There is a very light, floral fragrance. It fades quickly and I honestly don’t notice it at all anymore. This serum comes out of the bottle a translucent white color. It’s a very fluid gel and melts very quickly an nicely into my skin. It seems like the primary active ingredient of this serum is Ascorbyl Glucoside, which is a very stable derivative of Vitamin C that converts to ascorbic acid over a more sustained period of time than other derivatives. It’s been shown to mitigate sunburn and, in an in vitro study, inhibit melanin production. This serum also contains ascorbic acid and ascorbyl tetraisopalmitate (aka THDA), but both are listed after phenoxyethanol, which usually means they are in small, <1% concentrations. Ascorbic acid does some cool things, such as increasing collagen production, improving skin hydration, lightening hyper pigmentation, and increasing skin density while decreasing skin furrows but works best in 15-20% concentrations. THDA is a really exciting and promising oil soluble form of vitamin C. It can allegedly absorb into skin faster than other forms of Vitamin C. In one study, a solution with 10% ascorbic acid and 7% THDA resulted in increased collagen compared to a vehicle solution and improved hydration. These extracts occur low in the list which means they are in lower concentrations but may bring some general antioxidant properties to the serum. Malic acid is an AHA (alpha hydroxy acid, a water-soluble chemical exfoliant) derived from apples. It is less irritating and milder compared to glycolic acid and lactic acid, the two most common AHA. In this serum, the concentration of malic acid is likely too low to do any exfoliating, but it may confer general antioxidant properties. If you’ve ever wondered what a fermented ingredients like lactobacillus/soybean ferment filtrate actually means, it’s this: take soybeans, add lactobacillus, then take the byproduct and filter (hence filtrate). The filtrate contain the partially digested, frequently beneficial nutrients (ie lactobacillus converts sugars to lactic acid) produced by the fermenting agents. So here’s the thing. If you want a vitamin C serum, one with 15-20% L’Ascorbic Acid (LAA) in addition to Vitamin E and ferulic acid is objectively the best, according to science. This serum contains ascorbyl glucoside, which has some cool beenfits in its own right (see Ingredients overview above) but just isn’t in the same league. I have been using this serum twice daily for the past 3 weeks instead of my usual LAA-E-Ferulic serum and it does not produce the same effects. That said, I enjoy using this a lot more. LAA serums are harsher (due to the low pH / acidity), smell bad, and unstable / prone to oxidation. In comparison, this serum has a lovely consistency and I can easily apply 3-4 pumps of it to my skin without any stickiness or unpleasantness. In terms of effects, this serum seems to boost hydration and prolongs the glow I get from other essences and serums that I use in my routine. This could be a good vitamin C serum for anyone looking for something gentle, fragrance-free, and/or halal and who can’t or doesn’t want to use a traditional LAA-Vit E-Ferulic Acid serum. This is a little on the expensive side but on the other hand is a vast improvement in both user experience and efficacy over the uber popular Klairs Juicy Drop Serum. Disclaimer: This product was sent to me at no cost for review purposes. The opinions expressed are my own.